Charlie Carrel enjoyed a huge breakout year in 2015, banking over $1.5 million in live tournament earnings and winning the 2015 PokerStars and Monte-Carlo® Casino EPT Grand €25,000 High Roller for an impressive €1.114 million. He can now add another high roller trophy to his case, as the English youngster scored first place in the €10,200 Single-Day High Roller at the European Poker Tour Dublin for €145,938. With the biggest buy-in ever just in the books with the completion of the €25,750 High Roller, the second biggest buy-in tournament ever on Irish soil took place on Monday. The 2016 PokerStars EPT Dublin €10,200 Single-Day High Roller started with just 17 players in their seats, but it got a lot busier soon enough. Before the first break, dozens more had signed up, and after registration closed, a total of 66 unique players had entered, 23 players reentered, a grand total of 89 entries was tallied, and a prize pool of €863,300 was generated. Action was fast and furious from the start, as one might expect in a one-day tournament. With blind levels of just 30 minutes, players busted out left and right. Steve O'Dwyer, €25,750 High Roller winner Mustapha Kanit, and Mike McDonald were just a couple of the players that hit the rail early. Around 11 p.m. local time, the bubble arrived as Daniel Dvoress lost most of his chips with jacks to Kevin MacPhee's pocket aces. 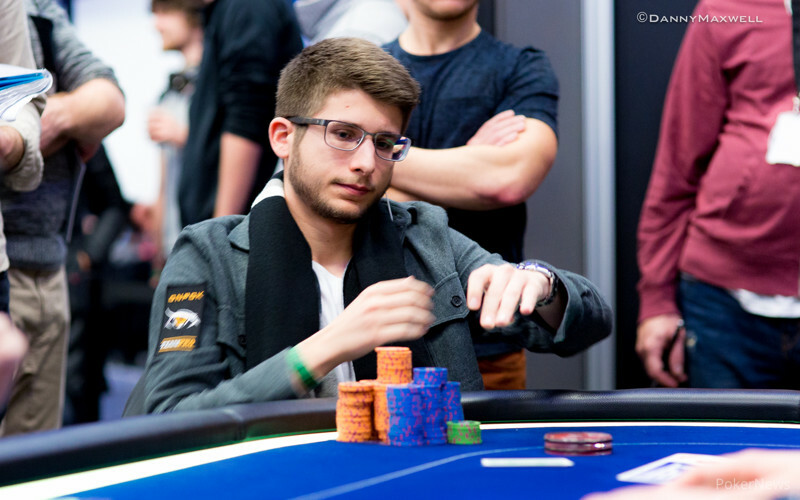 Dvoress was eliminated not much later when his pocket tens were cracked by the ace-seven of Francois Billard, and the remaining 13 players were in the money and guaranteed €17,270. The players didn't hold back, with 2013 World Series of Poker Main Event champion Ryan Riess the first to go when he lost with queens to ace-king to bust in 13th. MacPhee got the same €17,270 for finishing in 12th when his king-queen fell to Carrel's pocket tens. From there, Fernando Brito ran deuces into kings (11th - €18,560,) and Sergey Lebedev hit the rail not much later when his ace-king didn't improve against the jacks of Mark Radoja (10th - €18,560). 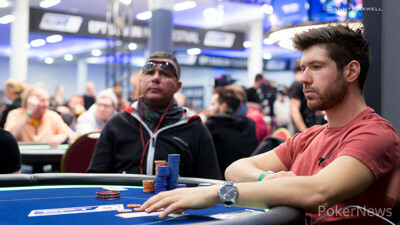 That set the final table of nine, with Radoja, the Canadian pro, in the lead. Viacheslav Goryachev was the first to go at the final table, as he busted in ninth place for €24,170 when his open-ended draw failed to hit against the threes of Charlie Carrel. Then, in a massive three-way all in, Senh Ung (jacks) and Jeff Rossiter (ace-queen) both fell victim to Radoja (kings). As Rossiter had slightly more chips to start the hand, he got seventh for €41,000, while Ung had to settle for eighth and €31,940. Demetrio Barreca had folded nines in that hand and would have won it because a nine had hit the flop, but instead he folded and got his chips in on the next hand with queens against Radoja. For Radoja, it was pocket kings in back-to-back hands, and Barreca had to settle for €51,800 after the board bricked out. Paul Tedeschi, who had fewer than three big blinds at the time, must have been excited to ladder the payouts, but he only jumped one rung before he was eliminated. The remaining four players exchanged chips quite a bit, with short stacks doubling and big stacks losing large chunks of their stacks. Dominik Nitsche doubled through Radoja with a limp-shoved ace-king against ace-ten in a battle of the blinds, but that same Nitsche doubled Carrel with ace-jack versus ace-four when a four hit the turn. Nitsche also doubled Francois Billard with ace-seven versus ace-jack. With the stacks pretty close together, the four players opted to make a deal. They divided the money and left €29,900 and the trophy to play for, as follows. Francois Billard was first to go after the deal was made, finishing fourth when his ace-ten got outflopped by Radoja's king-queen. Radoja flopped top two and turned a full house to send his countryman home. The three-handed situation took some time, but eventually Radoja made his exit in third. He pushed with queen-six from the small blind and Carrel called with the ace-eight to win. Heads-up play between Carrel and Nitsche saw the pair decide to make another deal and chop up the remaining €29,900. That didn't stop the two from battling hard. Nitsche wanted the trophy bad after having won the UKIPT High Roller for €156,160 earlier this week. Carrel, after having finished third in the €25,750 High Roller just last night, really wanted the trophy, too, though he admitted to not have a spot for it as he doesn't have his own place and travels from hotel to hotel these days. The two played fierce with river check-raises, big overbet bluffs, and action plays all around. Carrel won the better part of the hands and regained the chip lead with a lot of shoves. He had Nitsche down to 2.5 million of the 8.9 million in play when the final hand came up, and the German limped in from the button. Carrel then raised it up and snap-called Nitsche's shove. "Call, I have aces!" Carrel said. Nitsche had ace-queen and, despite flopping a gutshot to Broadway, he did not get there and had to settle for second place. Carrel took down the title and was handed the trophy, while Nitsche made slightly more money. While that wraps up PokerNews' coverage of this event, the €5,300 Main Event is in full swing and Day 2 awaits. You can follow along with the updates from that tournament on Tuesday starting at 12 p.m. local time here. In the meantime, check out this interview Sasha Salinger did with Ryan Riess, who came to Dublin for the first time after watching a thrilling Conor McGregor victory in Vegas this summer. He told PokerNews how he is enjoying the city and culture while also playing a bit of poker. 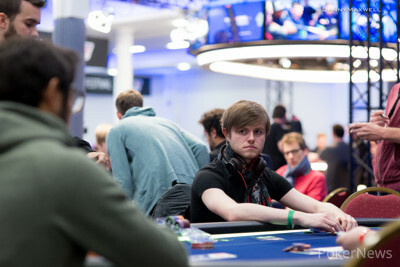 Charlie Carrel pushed Dominik Nitsche off pot after pot until he had taken the lead. Then Nitsche limped in from the button and Carrel made it 400,000 to go in the big blind. Nitsche shoved all in for 2,435,000 and Carrel snap called. "Call, I have aces" he quickly added. The flop came leaving Nitsche some outs. The on the turn and on the river however didn't fill up his straight, and Nitsche made his exit in 2nd place with just 1 minute left on the clock on the last level of the official structure sheet. Nitsche had already locked up €139,450 in the 4-handed deal, and had secured himself another €18,562 in the heads-up deal, but the trophy he did not get. "You're Gonna Make Yourself Look Silly On This One"
Dominik Nitsche limped the button and Charlie Carrel checked from the big blind. Carrel checked on and Nitsche bet 160,000. Carrel check min raised to 320,000 and Nitsche called. Carrel fired 400,000 on the and Nitsche called. The completed the board and Carrel shoved all in for 1,730,000. "You're gonna make yourself look silly on this one" Carrel said with a sneaky smile after Nitsche indicated he needed some time. Nitsche eventually folded, and said "Ok Charlie, show me a bluff!" Carrel tabled his for indeed a bluff, and started stacking again. On the button, Charlie Carrel raised to 250,000 and Dominik Nitsche made the call. Nitsche then check called a bet of 200,000 before both players checked the on the turn. The hit the river and Nitsche checked again. Carrel bet half a million and Nitsche check raised all in. "Snap check the river huh? So strong!" Carrel said before he eventually folded. Nitsche offered to show one, and Carrel picked the . Carrel assured himself Nitsche had jack-nine and they went on to play another hand. The two players have decided to chop the remaining €29,900 according to the current chip counts. They now play for the trophy, which they both really want. Play is underway, still with blinds at 60,000/120,000 (20,000 ante). Mark Radoja became the shortest of the three and shoved the small blind holding the . Charlie Carrel woke up with the in the big blind and made the call. The board rolled out sending Radoja home third. 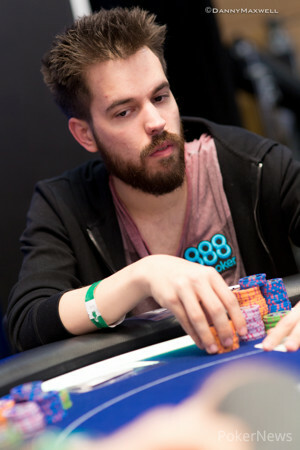 On the button, Mark Radoja raised to 210,000 and Dominik Nitsche made the call from the big blind. Nitsche checked on and Radoja fired another 210,000. Nitsche check raised to 525,000 and Radoja called. The fell on the turn and Nitsche bet another 600,000. Once again Radoja called. With the completing the board, Radoja had about 1.9 million left. Nitsche moved all in and Radoja tanked for a bit. "This might be the first tough decision this tournament" he exclaimed, "I just don't see you can bluff here." He eventually folded, and Nitsche silently slid his cards into the muck.